In addition to the Comforpedic Impaction Reduction Material that is used for the inserts which compress in size to conform to your horse, it molds to the conformation of your horses’ back and keeps your horse’s back cooler by moderating and managing the surface temperature, keeping it close to their body temperature. That helps keep the back cooler, which makes the horse more comfortable. Wool felt is next to the body, allowing it to breathe 100% and to wick moisture away from his back, keeping it cooler and allows for faster muscle recovery.. The open cell material also helps to stabilize the temperature and allow moisture to evaporate. It is also anti fungal and anti bacterial…. The pads have Equigrip Strips that keep the pad from slipping, in all terrains. 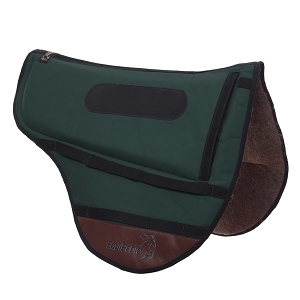 The pads are contoured to fit most saddles, absorb shock and protect your horse’s back. I have used this pad in all terrains and on quite a few different horses, all with different conformations. It has not slipped and has kept the sweat marks even all around, meaning no sore spots. This pad certainly has all the therapeutic benefits needed and is the most comfortable pad for my horse. They are completely washable and machine dryable. The inserts come out and can be soaked in a vinegar solution, dried and put back in. They are extremely well made and will last quite a long time. Once you try an Equipedic pad, you will never go back to any other. For more information about EquiPedic and its products visit www.equipedic.com. To contact EquiPedic, please call 575-523-0900 or email rsacks@equipedic.com.